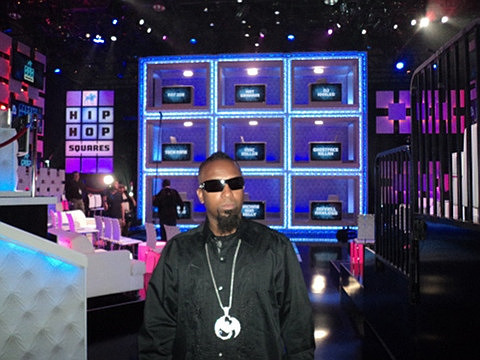 On May 22, MTV2 will launch Hip Hop Squares. Inspired by the original Hollywood Squares, the new game show will feature some of the biggest names in hip hop and entertainment. While we’re just as excited as everyone else to see how the personalities will mesh, we’d be lying if we said we weren’t tuning in mainly to catch the Kansas City King, Tech N9ne, kick off the very first episode. With the promise of wild antics and hilarious moments, we are looking forward to Tech’s grand debut on the series. In anticipation of Tech N9ne’s appearance on the squared game show, we compiled our top 3 things we expect to see from Tech. There’s no shortage of entertainment on this show and who knows what Tech will do! Seriously, Kat Graham is on the show with Tech. Take aim my dude, take aim. Throw out the ticket stub. With the world watching, what better time to put them on to “Abu Dhabi”? Teach them well Tech. If they don’t know, they gon’ learn today. We have no idea what Tech’s got in that glass. How potent is it? Did they allow the guests alcohol on set? All we know is that if it does turn out to be a mixed drink, the results are bound to be hilarious. Cheers, Tech. Tune into MTV2 Hip Hop Squares On May 22 at 11PM EST/ 10PM CST! 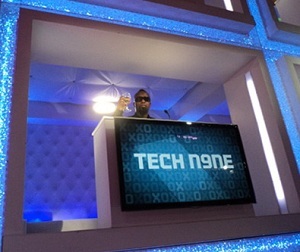 What do you expect to see from Tech N9ne?